If Onyx has been configured to look up participant information stored in an external system (a “participant registry”), the enrollment procedure is slightly different. You will first search for the participant in that system, using whatever unique identifier that system requires. After that, you will assign to that participant a Participant ID. The prerequisites are the same as in “regular” enrollment. The Participant Registry button is displayed in the upper right corner of the Participants page. See this figure. Select the Participant Registry button. 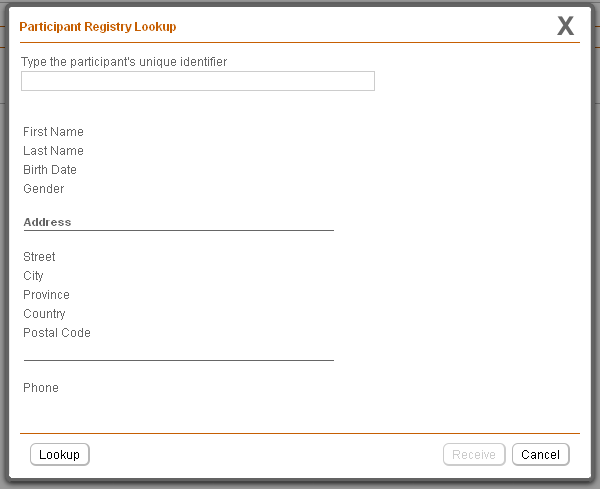 The Participant Registry Lookup pop-up window is displayed. See this figure. Enter the participant’s unique identifier and select Lookup. Upon a successful lookup, the participant fields will be filled in with the retrieved information. To enroll the participant, select Receive. The Volunteer Registration page will be displayed. Now proceed the same way as with “regular” enrollment. If you decide not to enroll the participant, select the Cancel button. The Participant Registry Lookup pop-up window closes and the Participants page is redisplayed unchanged.